As we all know, no mobile operating systems in this world is error-free, so does the Android OS. There are many problems which keep occurring on your android smartphone while you are using it. This is nothing but getting rid of the random errors which keep popping up on your smartphone just like "Unfortunately the Process.com.android.phone Has Stopped" error message. Many of us face this error message on our Android phone. Sometimes it is easy to solve these issues in a quick manner, but sometimes it takes time to find the reason behind it. Such errors usually encountered when we install new ROM or update our OS. Sometime it may be something wrong had happened with your OS by installing any applications. There are number of reasons why such Android error messages may appear, but most of the time, the 'process com.android.phone has stopped' suddenly triggers the error while receiving the calls, connecting to the mobile data. Specifically, this error message is occurred due to the phone or 'SIM toolkit' app installed by default on your mobile. So, if you are continuously getting the error of “Unfortunately the process.com.android.phone has stopped” error, there are a number of steps to fix your mobile as below. Recently, I have published an article about Top 12 Things You Should NEVER DO on Android Right Now and today I'm going to share some quick fix solutions for Android errors. 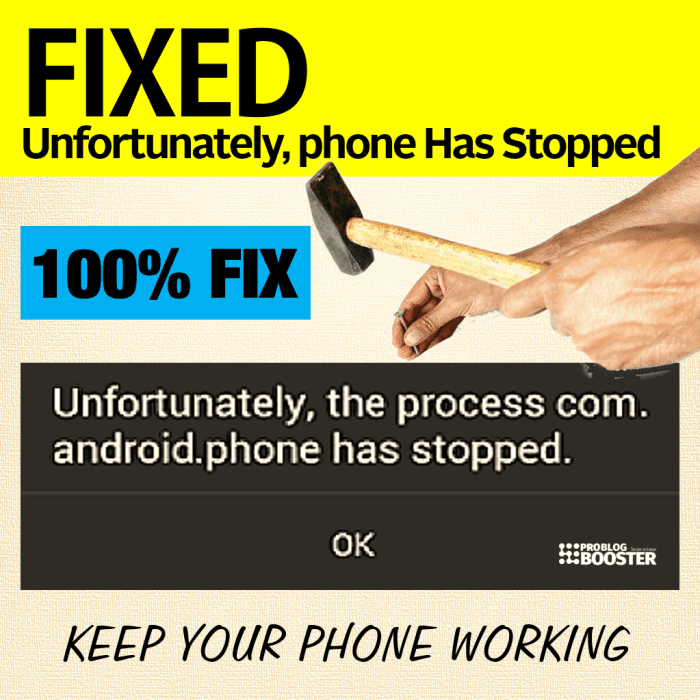 Solution to Fix “Unfortunately the Process.com.android.phone Has Stopped” issue. Scroll down and tap on Phone option. If still, you getting this error, then try the next solutions as well. Step 2: Clear cache and Data from SIM Toolkit. Just follow the same steps mentioned in Step 1, just select SIM Toolkit options from application list and then Clear cache and Clear data. Follow below steps only if all the above 4 steps didn't work for you. However, you must take the back-up of your phone before implementing Step 5. Go to Setting >> Backup and Reset option. Under Personal data section, tap on Factory data reset option. After Restart, you will find your phone got reset and no data will be present on your phone. This is one of the last try to resolve this error.